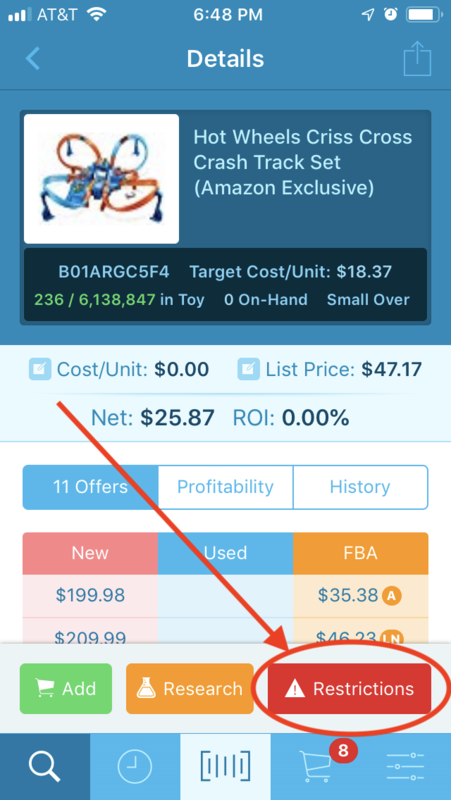 Retail arbitrage sourcing for your Amazon FBA business is only possible if you use a high-quality scouting app. For several years, we at Full-Time FBA have depended on the Scoutify app from the makers of Inventory Lab. We’ve published numerous blog posts and videos on the topic of how great Scoutify is, and we’re excited now to consolidate the most pertinent info on the Scoutify app into this updated 2019 post. If you’ve heard us here at Full-Time FBA talk on YouTube in the past, you know that we prefer not to use the Amazon Seller app for sourcing. 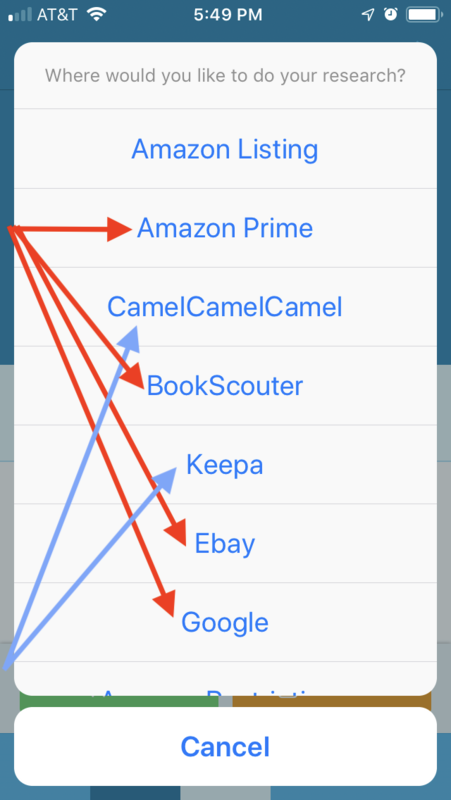 We’ve discussed in a previous blog post why we think the Amazon Seller app works great for certain functions, but not for sourcing. Today we’re going to share with you the reasons why we love using Scoutify as our sourcing app. 1. Gives an easy-to-read summary of the basic info you need to make your sourcing decisions. Among the plethora of info Scoutify provides are the item name, picture, category, size tier, sales rank, number of offers, and pricing for new and used offers by Amazon, FBA, and Merchant Fulfilled sellers. 2. Shows an item’s sales rank percentages. In addition to showing an item’s current sales rank on Amazon, Scoutify also shows where an item falls in its Amazon category’s sales rank percentage, whether it’s the top 1%, top 3%, or whatever the case may be. A quick tap on the sales rank number will show you what percentage that sales rank number is in comparison to its category. 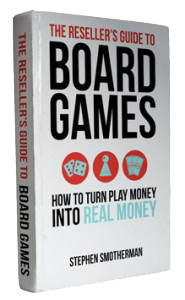 It’s great to be able to see at a glance how an item’s sales rank compares to the rest of the category and see how fast an item might potentially sell on Amazon. 3. Links to pricing info on Amazon and other websites. 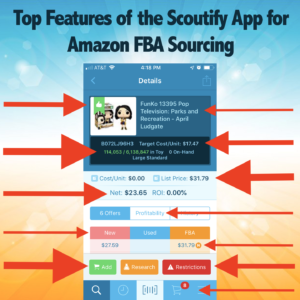 In addition to a quick link to each item’s product page on Amazon, Scoutify includes quick links to the Amazon Prime offers to compare FBA prices, to BookScouter.com, to eBay, and to Google. It’s super quick and easy to do a little extra research on how an item is priced across multiple e-commerce platforms before making a buying decision. 4. 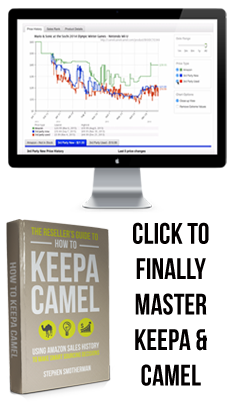 Links to Amazon sales rank and pricing history graphs (Keepa). I cannot stress enough that one of the biggest factors for us in using a third-party scanning app is the ability to quickly and efficiently access sales rank and pricing history while we’re sourcing. We desire to always make smart sourcing decisions when doing retail arbitrage, and the only way we can avoid buying inventory that is destined to have plummeting prices and skyrocketing sales ranks is to do the research on sites like Keepa while sourcing. The Amazon Seller app does not provide those quick links, which is a deal breaker for us as a scouting app. 5. Allows you to see both gross and net profit on items you’re scanning. Scoutify will show you the gross profit of an item based on shipping fees and FBA costs deducted by Amazon. You can then enter more information about your cost of goods and other costs associated with prepping, packing, and sales tax, giving you your net profit. Again, the more information like this you can see up front, the better sourcing decisions you can make while out doing retail arbitrage. 6. Allows you to set a target buy cost. 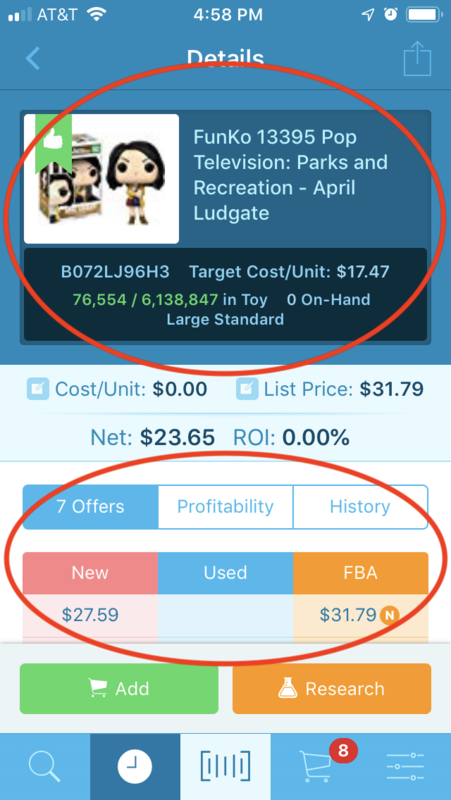 By setting a target buy cost in Scoutify (by entering your desired ROI in the app’s settings), you’re allowing the app to help you find items with the right amount of ROI for your buying preferences. Scoutify will clearly show you the highest dollar amount you can purchase an item for before you start leaving your ROI range. 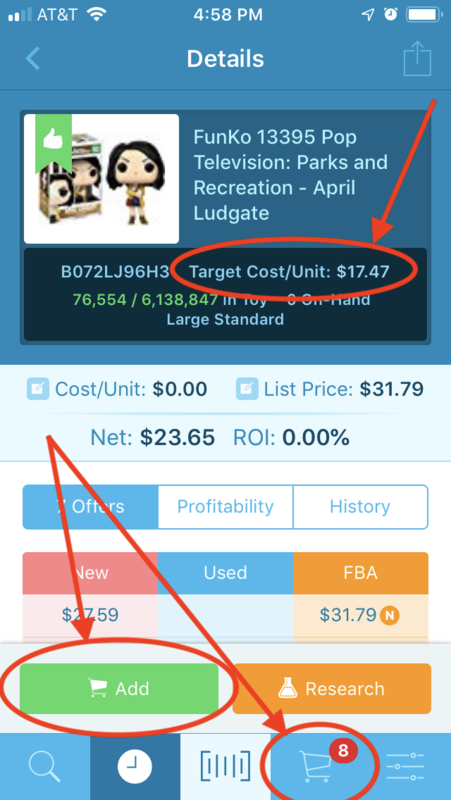 Create a buy list with your buy cost for each item, supplier (if you have more than one person sourcing for your business), and date purchased. When you’re done sourcing, you can upload your buy list to Inventory Lab to quickly create your shipping batch. You can then use this information in Inventory Lab to keep track of how quickly items sell, how much commission to pay your sourcers, or how much wiggle room you have for repricing and still maintaining a sufficient return on investment. 8. Provides easy restriction notifications (plus easy access to apply for approval). Scoutify makes it easy to see on their main app page if an item you have scanned is restricted for you to sell on Amazon. Tapping the Restrictions button will allow you to see which conditions of an item you can or cannot sell on Amazon. If you see that you’re restricted for an item, you can tap on the Research button to find the quick link to apply to sell the restricted product. Check out this post to see a video of this feature in action. 9. Gives you important inventory information. When you scan an item with the Scoutify app, you can see on the main page whether you already have units of this item in stock at Amazon, whether you have sold it in the past, or whether you have purchased items but not yet sent them to FBA. This feature is a game changer! I love being able to know at a glance whether I’m already deep enough in stock or whether I should buy more units. 10. 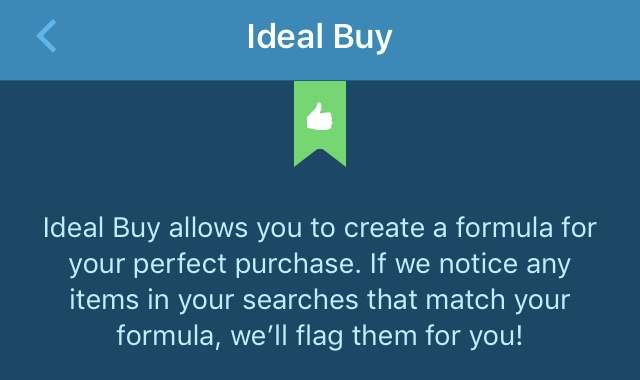 Create your ideal buy. Scoutify allows you to program certain parameters into your account so that you can easily see if an item meets your criteria for an ideal buy. For instance, you can indicate whether or not you’re willing to compete with Amazon, your maximum number of competitor offers, and your sales rank parameters – yet another way that Scoutify shaves seconds off your sourcing time per item and reduces the number of decisions you have to make. 11. Comes priced in a package with Inventory Lab listing software. In a recent blog post, we listed the main game-changing reasons why we use Inventory Lab to list our products for sale on Amazon. We really love the fact that Scoutify and Inventory Lab come together for one package price of only $49/month. When you sign up for Inventory Lab you can get your first month free and try Scoutify out while doing retail arbitrage. 12. Available for iPhone and Android. 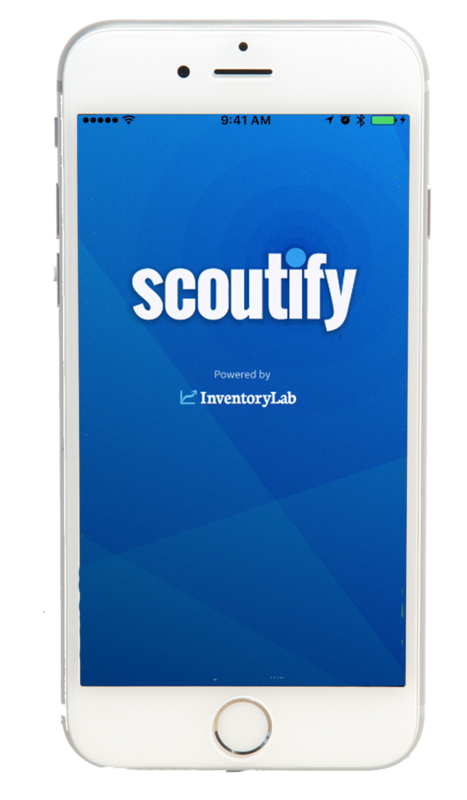 You can download the Scoutify app for free for both iPhone and Android smart phone platforms, but you will need to log in to use it with your Inventory Lab account info. 13. Has bluetooth capabilities if you use your smart phone with a device like a Scanfob. We don’t use this feature, but we know some Amazon sellers swear by using bluetooth scanners. 14. Super fast bar-code scanning. Out of all the sourcing apps I’ve used, Scoutify scans the barcode the fastest. We all know every second counts and this one is a big deal to me. A big part of scaling an Amazon FBA business is the ability to reduce the number of times you touch your inventory and to reduce the amount of time you spend on each item while sourcing. Every second counts when you’re standing in an aisle of a retail store with hundreds of items to scan. We love how quick and easy Scoutify is to use for doing solid research before buying inventory. If you want to try Scoutify free for 30 days, click here. You’ll also get 30 days to try out Inventory Lab for free as well. I promise that once you start using Inventory Lab and Scoutify, you’ll wonder how you ever sold on Amazon without them. Do you use Scoutify for your RA sourcing? I’d love to hear what you have to say about the app in the comments below. Stephen loves helping people turn part-time hours into a full-time income via Amazon FBA. When not reselling or blogging, Stephen enjoys reading with his wife Rebecca, playing games with his kids, serving at his church, and watching baseball. i have not use this App but i will like to try it and see how it works. thanks for let me know about it, i have being looking for something like this. Thank you very much for the info. Can they both (Scouting and Inventory lab) be used for Online Arbitrage too, please? 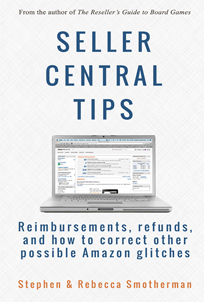 ​Enter your name and email to receive your free copy of Seller Central Tips: Reimbursements, refunds, and how to correct other possible Amazon glitches. ​We respect your email privacy. How Many Amazon Competitors is Too Many? At times we might use affiliate links for services or products we endorse. If you click through and purchase one of these items, I will make a small commission on the sale, but your price will not be any higher. I only post these links when I firmly believe they will help you and your business, and I do not endorse products or services that I haven’t personally used and found to benefit my business.